Victor Vekselberg won a major UK High Court action on Friday, and the presiding judge, Justice Guy Newey, has ordered that he should get his money’s worth returned. No ruling of fraud was allowed. The amount may turn out to be less than Vekselberg has spent on lawyers and experts over the 25 months the case has been pending. This isn’t the case currently under way in the London Court of International Arbitration where Vekselberg is suing Oleg Deripaska for violation of the shareholder agreements on the basis of which the two of them have been directing United Company Rusal since its formation in 2006 and merger with Vekselberg’s Siberian Ural Aluminium (SUAL) in 2007. That case was first reported here. The proceedings are being conducted behind closed doors. In the July 27, 2012, judgement which Vekselberg has won, the High Court has ruled that Vekselberg was sold a painting which isn’t by the modern Russian master, Boris Kustodiev. The court has also ruled that vendor or agent claims about the portrait were rubbish, and the profit pocketed by the vendor and his agent is forfeit. The canvass purportedly bears Kustodiev’s signature and the date 1919. That was several years before he died. The painting itself never appeared in public in Russia, but surfaced in an exhibition in Riga, Latvia, in 1932. By then it was owned by an émigré Russian named Leo Masovsky. He and his wife managed to get it and themselves out of Riga before the war arrived, and it was in Germany in 1989, that the widow Masovsky consigned the painting to auction by Christie’s in London. 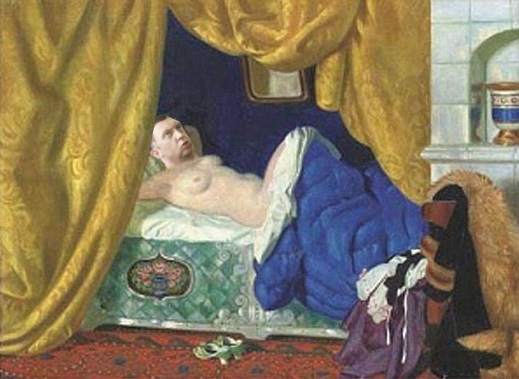 The painting, renamed Odalisque and with Christie’s warranty that it had been painted by Kustodiev, went for £19,000. That was on October 5, 1989. For sixteen years it hung in the collection of a Lebanese family. Then Christie’s told the owners that if the work were to be auctioned again, a wealthy Russian buyer might pay ten or twenty times their outlay. So in 2005 Christie’s was commissioned to sell it again. This time the auction house claimed that “without doubt, [it is] a trophy painting for a Russian sale” .In retrospect, Christie’s has admitted in court that what it had claimed during the earlier sale was “unsatisfactory”. That is, it had gotten the colours of the painting wrong, and applied a description meant for quite another work by Kustodiev. Vekselberg paid £1,720,000 for the painting (including VAT). The bidding agents and Vekselberg’s art collection advisors discovered their purchase was a forgery in November 2006. But when they wrote Christie’s a letter asking to return the work and issue a refund, Christie’s claims the letter had been lost in the mail. More than three more years were to elapse as Vekselberg collected expert testimony that the work was a fake. The lawsuit was lodged in June 2010, but another 20 months went by before the case went to trial in the High Court. It’s over now. The judge’s ruling accepts the opinion of Vekelberg’s experts, including representatives of the State Russian Museum in St.Petersburg and the Tretyakov Gallery in Moscow that even if Kustodiev got clumsy with his stoves, curtains and colours from time to time; and even if he made anatomical mistakes with his sitters’ bodies, this one certainly wasn’t painted by him.